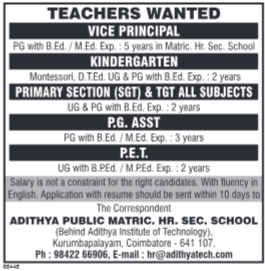 Aditya Public Matric Higher Secondary School, Coimbatore, Tamilnadu advertised in Dinamalar for the Teachers recruitment 2019 – Teachers Jobs. For More Details see below. About School: At Adithya Public Matriculation Hr. sec School, aim to provide education for a better and prosperous future. In this 21st century, with the incredible advancement of technology and science, the world is emerging as a global village. 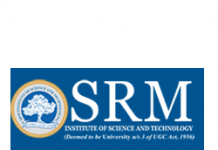 This has led the students of the present era to face great challenges to learn about the interconnected world.For this reason, we have come with an amazing number of methods.